An ounce of prevention is worth a pound of cure, as the old saying goes, and that's just as true in cybersecurity as it is in health. So believes Cylance, a startup that uses AI to detect and prevent cyberattacks. On Wednesday, Cylance announced that it just raised a whopping US $100 million in Series D funding. It will use the new infusion to expand its sales, marketing, and engineering programs. Dubbed CylanceProtect, the company's flagship product promises AI-based endpoint security while using a fraction of the system resources required by the approaches used in most enterprises today. Enabling that are technologies including machine learning. Whereas current techniques such as signature, heuristics, and behavior monitoring take a reactionary approach to threats and require an Internet connection, Cylance uses AI to proactively analyze a file’s characteristics and predict before it executes on the local host, whether it is safe or a threat. More specifically, Cylance extracts millions of unique characteristics from the code and analyzes them against trained statistical models to determine their intention. Rather than relying on hash comparison or post-run behavior heuristics to determine what to do, Cylance evaluates objects in less than 100 milliseconds, early in the run time process. That way, if the object is determined to be malicious, execution can be stopped. 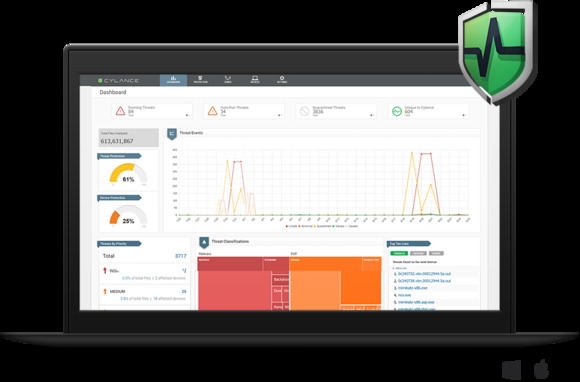 The software protects against system- and memory-based attacks, spear phishing, zero-day malware, privilege escalations, scripts and malicious programs, Cylance says, and eliminates the need for antivirus and intrusion detection and prevention systems. No Internet connection or daily software updates are required. Cylance claims more than 1,000 customers.